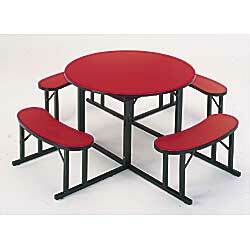 Functional and sturdy tables are lasting solutions to your cafeteria or breakroom needs. Bench and table combination offers comfortable seating for up to 8 people. SPECIFY COLOR: BL - Blue, RD - Hollyberry Red, WL - Walnut, WS - White Sand, YL - Yellow. FOB ALABAMA. TOPS. 3/4" flakeboard with stain and scratch resistant high pressure laminate, with backer sheet and black edging. BENCH SEATS. 1-1/8" flakeboard with stain and scratch resistant high pressure laminate, with backer sheet and black edging. APRONS. 2-1/4" semi-box type with square corners. Black baked enamel paint. BASES. 1-1/4" x 18-ga. square tubular steel with reinforced steel bracing and adjustable glides. 30" overall height. Black baked enamel paint. 48" Square Table seats 4-6 people.